The Upstairs unit features a fully equipped kitchen complete with Dishwasher, Microwave, Toaster, Coffee maker and all the pots, pans, dishes and utensils you will need. The master bedroom is located on its own level and has a king sized bed, a 32′ flat screen TV, and a really nice private bathroom. 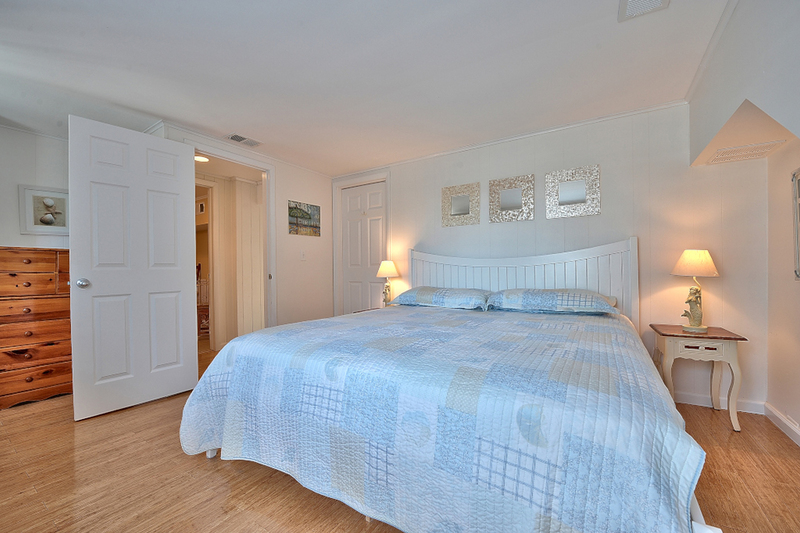 On the main floor there is a queen sized bedroom, and 2 bedrooms each with 2 twin beds. The living room has a 42′ flat panel TV with DVD player. Bamboo hardwood floors are throughout the home. There is a dining deck off the living room of the main floor and the Upstairs unit has exclusive access to the rooftop deck which walks up from the dining deck and offers great ocean views. There is an outdoor shower on the side of the house and a patio in the back yard with a large gas grill. The Upstairs features central air throughout. Scroll down to see photos, floorplans and all the amenities. There’s no better place for a family vacation than at the beach. We have games, books, puzzles and beach toys for the little ones. Enjoy High Definition Television provided by Comcast. Click here to view our current channel lineup (updated 1/31/2019). Each unit has its own kitchen including full-size refrigerator/freezer with ice maker, oven & cooktop, microwave, drip coffee maker, cookware, dishes and utensils. Both units have access to a private, fenced-in backyard. There is a clothesline for hanging wet towels and swimsuits, a shed for storing bikes and beach gear, dining and picnic tables for family meals, and a large gas grill for cooking. We have both a traditional drip coffee maker and a Keurig single cup machine in each unit. So whether you just need one cup each morning, or the family needs a full pot every day, we have you covered. We provide basic cleaning products for your stay. This includes a mop, broom, vacuum, sponges and assorted cleaners. We also provide hand soap, dish soap, dishwasher detergent, laundry detergent and trash bags. While we strive to take care of our guests needs during their vacation, some things we are not able to provide. Toilet Paper & Paper Towels – We provide a couple of rolls to get you started, the rest is up to you. Bath Soap, Shampoo & other personal products are also not provided. Ask about our pay-by-check discount and save! **May be subject to NJ Sales & Occupancy Taxes. Take a peek inside and see why Summer weeks go so fast. No high school or college groups. No groups under the age of 25. No Exceptions. No smoking in the house, no parties, no pets allowed. No children on the roof deck without an adult. Weekly rental changeovers are on Saturdays. Towels and Bed Linens are NOT provided but can be added as an option. No Cleaning fee charged on weekly rentals. When you are ready to book, review our calendar below for available dates. Then fill out the form with the required information and press “Submit”. This will tentatively reserve your dates. We will contact you in order to confirm your reservation and coordinate signing the rental agreement and making payments. Note: We only accept reservations 350 days in advance. If you would like to be placed on our waiting list, or have a special event that requires advanced planning (like a wedding), simply enter an inquiry and note in the comments your desired dates.